Da'Quan Cook (205-F-87, college: St. Bonaventure) is coming off his most acclaimed season as a professional. 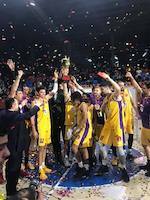 In his sixth season as a Pro he was named to the Asia-Basket.com All-Kazakhstan 1st Team as well as being honored as Forward of the Year for BK Barsy Atyrau. Aside from the recognition, Cook also posted his most well-rounded statistical season (13.5ppg, 5.9rpg, 3.0apg, 1.3spg) of his career, showing the maturation and development of his basketball understanding during the prime of his basketball years. The Elizabeth, New Jersey native who played collegiately at St. Bonaventure (NCAA1) took some time to go over his past season and preparations for 2018-19. Q. First off congratulations on being named Asia-Basket.com All-Kazakhstan 1st Team and Forward of the Year. Looking back on the season what is your assessment of your play and the team's achievements? A. First off thank you. Looking back on the season my assessment of play was to use the most of my versatility by playing inside and outside on the perimeter to give a lot of guys my size a hard time defending me on the perimeter; which created a lot of options for me. This year was a good year for me, my coach and teammates allowed me to play to my strengths. 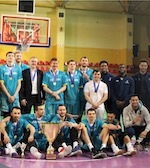 To be able to go play against a good club, such as BK Astana in the finals was great for us. Although we finished in 2nd place, we proved that we can play and compete with a great club. Q. What was the biggest adjustment for you to play in Kazakhstan as opposed to other countries you have played in? A. The biggest adjustment for me to play in Kazakhstan was the 10 hours or more of traveling & preparation before games as opposed to playing in other countries. However, being mentally strong and always working on my craft I was still able to perform. Q. In terms of competition, how did the Kazakhstan domestic and international Baltic League (7 games: 11.1ppg, 6.7rpg, 1.0spg) compare to your previous stops? A. Playing in two different leagues during the course of the season was a first for me. But it was great being that the Baltic League was a lot stronger in talent. Every night you have to be ready to play at the highest level and adjust on the go. Q. Since your offseason has started, give us an idea of your workout and training schedule? What do you do to keep busy when not on the court? A. Since my off season has started I like to work out 2-3 times a day. Either if it's skill work, cardio, or weight lifting I am doing something to get better every day. As well I will play in a few summer leagues throughout New York City and New Jersey. While at times I'm not on the court I'm working on my brand 'Grind Comes First', as well as giving back to my community. Q. What are your plans for the 2018-19 season? A. My plans for 2018-2019 are to get into a good league and have a solid agent behind me that will have my best interest at all times. I am open to all markets.